After noticing all my “Film Favorites” pieces were from decidedly older films, I decided to incorporate a few new ones to the mix for balance, starting with a couple under-seen modern films from the most recent year I don’t cover in my “newer films” section, 2007. Both of these films are desperately under-seen and subversive masterpieces of modern cinema in wholly different ways. Guy Maddin has made a career out of recreating early silent and sound cinema. His films approach us as documents of a long-lost time, alien products of our own making. They feign documentaries, but they test the line with a sort of fragmented operatic grandiosity. However, if My Winnipeg is a document, it’s hard to say to what, or in what form. Is it a reflection of the ’20s as it was lived, or as films from that period depicted it? It’s both, in fact, and much more, bleeding together art and life with rambling, rambunctious, disharmonious, elliptical force and playing around with cinema and its relation to life in some of the most unexpected of ways. Superficially, My Winnipeg is Maddin’s ode to his hometown of Winnipeg, Manitoba. Partially, this holds true throughout, but each scene leaves us more hesitant. Maddin narrates, but is played on screen by another actor, and he matter-of-factly speaks to us almost uninterrupted from beginning to end, at a tone somewhere between nostalgic loss, soothsaying playfulness, bitter melancholy, and non-committal horror. He posits that he wants to leave Winnipeg, and that he can only do so by distancing himself from it through making it his “object” for a film. We would suspect a documentary, but all manner of feverish, psychoanalytic narration betrays something more akin to a descent into madness, making the film an analysis of a person more than a place. The core of the title then is not Winnipeg, but my, positing not that this is Winnipeg but a deluded and diluted artistic reflection of Winnipeg form the mind of someone lost to its ballet of shadow and blinding light. If so, the film still foregrounds a mesmerizingly physical sense of place and time, giving us a land at once modern, of the forever-past given to the film’s faux-’20s aesthetic, and present only in the locked up corners of a mind looking to the past and forever unable to see it whole again. Maddin interlocks image and sound like anxious poetry, slowly growing more perturbed and worried as the film continues, getting ever-more lost in Winnipeg’s spell as he spirals deep within the frigid north. Visually, the tricks on display confound as much as they reveal, and they are too numerous to make sense of individually. The most obvious one is the sterling black-and-white cinematography which changes form on a scene-by-scene basis and gives us alternately a glowing ’20s melodrama, a home video of another world, and an art-film straight out of Soviet montage, not so much the rapid-fire kineticism of Eisenstein but the playful elliptic whiplash of a Vertov. Added to all this we have the way Maddin throws in actors to serve as his childhood family, expounds upon how fake they are in the roles, comments on their acting, and then has them engage in actions wholly unrealistic. Eventually, he wholly abandons them, finding his camera steadily more interested in the tangents of Winnipeg’s back alleys and the fleeting memories, real, half-imagined, or wholly artificial, of being abused by the town’s children and basking in the Olympic glory of his idols. The whole thing plays like a kaleidoscope of formal invention, but it’s never didactic. It creates a wintry wonderland as glorious as it is lurid and nasty, as achingly beautiful as it is sinuous and serpentine, the kind of place someone might imagine when they’ve seen too many movies and their hometown becomes one with the world of film. At a base level, My Winnipeg is merely a cavalcade of the most ambidextrous images – exciting and haunting in equal measure– 2000s cinema ever produced, all both lulled to sleep and beckoned forward by Maddin’s multifaceted, whiplash narration. On this level, it’s pretty astounding in itself, but the layers upon layers of complication and filmic reinterpretation imbue the images and sounds of the film with the spirit of the ghost of Chris Marker. We leave with no idea what Winnipeg is, nor any idea of how to even approach the thought of the place. That, more than anything, signals Maddin’s provocative, confrontational final product – the thought of a documentary about his life, turned into the raving tangents of a lunatic for whom film and reality can’t be pried apart, even from his cold dead hands. It’s a commentary on “truth” in cinema most foul. It’s no surprise to anyone who has seen any popular Swedish cinematic export that the nation’s penchant for mournful, laconic odes to human desperation is always dangerously on the verge of keeling over into a pitch-black observation of human frailty with a darkly comic zing. Although Norway and Denmark are more famous for Scandinavian comedy as chilly and low-lit as the long winter days in the frigid North, Roy Andersson’s You, the Living seeks to show Sweden can have a little fun with itself, and at humanity’s expense. 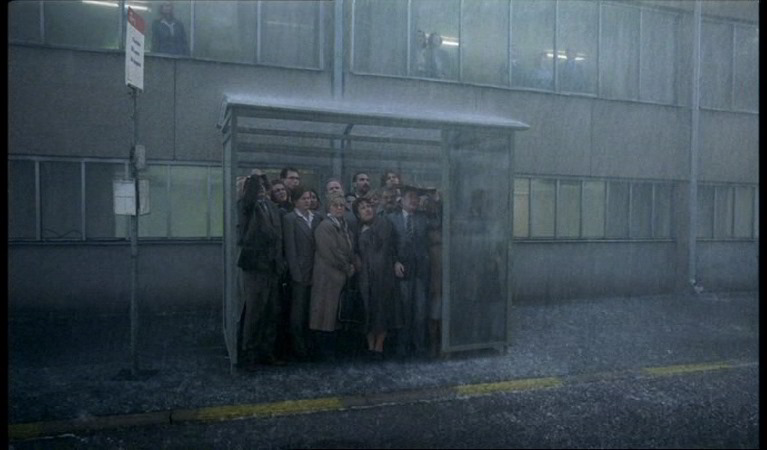 Structured as a series of looping dioramas of day-to-day despair, You, the Living’s tone is imparted right in its title: quirky but bitter, existential and ambiguous but brutally simple and direct, droll and dreary but cheeky and playful. It’s a brittle little film, setting up its camera at odds with the people it depicts. It moves between subject and subject and makes them objects for its particularly glacial chipping away at human nature. It’s not a narrative proper, but a cornucopia of vignettes with a dark heart. Discussing the contents of the vignettes would spoil the fun, but they each tackle a person or group of persons (not) coping with a particular personal tragedy and generally growing sad, flustered, or frustrated with the little things of the world around them. But Andersson is not out to help them or find sympathy for them; he’s here to mock them. He doesn’t invite connection, bringing the characters unto us. He sets them off and watches them from above. That’s satire for you: smug and superior, and damn proud of it. Comedies are not typically known for formal investment, but Andersson trades in dialogue for visual observation and finds symmetry and harmony in human connectedness. His camera probes, and it finds linkage in phrases, framing, and music in particular (a brass band being a particular source of rage for many a character, its deranged jauntiness wonderfully at odds with the stilted, stolid humans at the film’s core). Many of the stories (sequences, more accurately) re-frame others, depicting the backgrounds of previous ones or sideways glances of characters in others, connecting each person by the holistic and thorough way in which they are resolutely disconnected from the people who live around them but don’t bother to notice. Some of the more amused, sprightly bits are almost Tati-esque in their fascination with modern society and inhuman ludicrousness, but the majority have been left out in the cold too long for sprightliness. Even as it puts on a poker face of human disdain, You, the Living really gives itself unto the audience with a terse directness and a take-no-prisoners attitude toward how it so forthrightly equalizes all humans as fodder for comedy. Curiously, the way it so bluntly puts our insecurities and shared inadequacy out for all to see is unexpectedly humanist, saying, essentially, that our inadequacies make us human. In fact, they make us what its title suggests, “the living”. For if we didn’t buckle and fall apart under duress (or mild displeasure), if we didn’t have foibles so small we’re too embarrassed to mention, we’d be dead. It’s a quarrelsome, ornery little bugger of a film, but You, the Living doesn’t want us dead. It finds delight and poetry in our flaws, and thanks us for existing. Strange and caustic, yes, but curiously humbling. This entry was posted in Film Favorites, Review and tagged Canadian Cinema, caustic humor, cinematic deconstruction, Film Favorites, is this a comedy?, Metatextual Madness, Score: 10/10, Swedish Cinema on December 10, 2014 by jakewalters98.